Who Will Get the Water, When Push Comes to Shove? 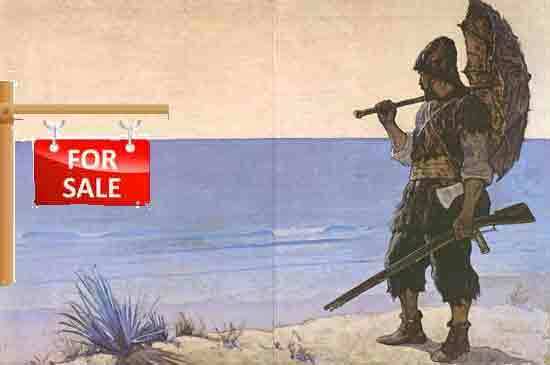 This post series encourages stakeholders to become as knowledgeable as possible in the shortest possible time in order to effectively participate in the design of their water futures, which are for sale to the highest bidders. Over the next 10 years water use is destined to become closely monitored, metered, and regulated by agencies both appointed and elected. Need to know for stakeholder-stewards includes such basic as how water is measured (acre-feet as well as gallons), how geography relates to regional water accounting units (DAUs), what aquifers or water-basins are, how ground-water is depleted, clean-water scarcity as a world problem, what are the sources of all water supplied to Californians, very local issues such as what it means to the community when a specific DAU cannot meet its water need, who determines allocations and use, and more. Long-term design is most likely to successfully meet all stakeholders' goals when based on science, inclusive demographics, as well as accounting for and balancing the needs and desires of specific interest groups like agribusiness, environmentalists and planners. The conflicts of interests with the greatest impact on individual water futures in California is that of sustainable water use and the California agricultural lobby, with groundwater issues pivotal. The new water regulatory environment outlined by Governor Brown, with conservation measures ordered for urban users of a 25% mandatory cut in water use, still excludes specific regulations for agriculture, though agriculture accounts for 80 % of water use in California. The Central Valley, though climatically more desert than tropic, is considered the breadbasket of the world, but is not a natural world wonder but an intensely engineered one currently undergoing groundwater arms race, in which those who can afford to dig the deepest wells are those most likely to survive, until the aquifers are depleted. The conflict of interests with the greatest impact on individual water futures in Santa Barbara County is that of sustainable water use and the California agricultural lobby, with groundwater issues pivotal. The new water regulatory environment outlined by Governor Brown, with conservation measures ordered for urban users of a 25% mandatory cut in water use, still excludes specific regulations for agriculture, though agriculture accounts for 80 % of water use in California. The Central Coast, though climatically more desert than tropic, is considered the breadbasket of the world, but is not a natural world wonder but an intensely engineered one. No immediate conservation measures were mandated for agriculture. meanwhile, throughout the Central Valley, more wells are being dug deeper and at greater cost by those who can afford it to meet dwindling supplies of water for their purposes. Subsidence and Central Valley aquifer depletion are both collateral damage. Similar pictures reflect water scarcity drilling frenzy and groundwater depletion in Northern India, Syria, Saudi Arabia and the US. This is a water arms race, where he and she who can drill deeper survive longer while land is reported to be sinking half an inch a month and groundwater levels appear to be sinking faster in the Central Valley than anywhere else in the United States, according to a recent U.S. Geological Survey. While clean water and "the good life" are not usually linked in one sentence or thought, drought forces reconceptualizing what the good life ultimately depends on. Clean water. The City of Santa Barbara, to use one specific example used for the purpose of limiting the complexity of the water supply and demand issues to one relatively simplified, localized example for possible better understanding of how water supply and demand work in most regions of California, depends on five different water supplies to meet local demands: Local Surface Water, Local Groundwater, State Water, Recycled Water, and Desalinated Water. Each of these will be addressed below to evaluate how they might or might not meet SB community demands for clean water. 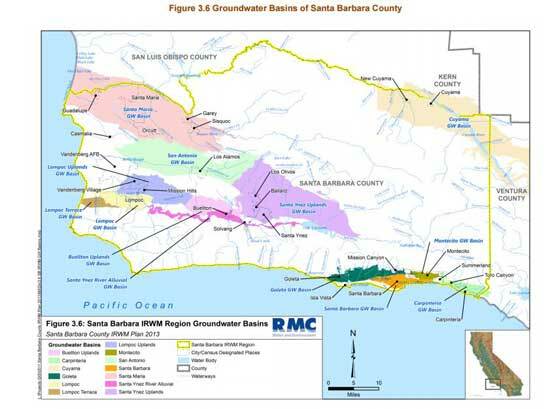 More than 50 groundwater basins have been identified in SB County. Prioritization studies suggest that several regions are at risk for supply exceeding demand: specifically the Cuyama and San Antonio regions. In August of 2015 the Cuyama Valley DAU is considered an area in which supply already exceeds demand. A groundwater basin is defined as the underground area from which groundwater drains. Basins can be separated by geologic or hydrologic boundaries. State water allocations depend not only on politics but also on rain, diversions from the feather River, e.g., all demands on this supply and their priorities. None of the above will meet water demands in SB County. When speaking of large water quantities, the unit of measure is the acre-foot or acre-inch, the amount of water required to cover one acre either 12 inches or 1 inch. Most Americans are familiar with gallons, so to get an idea of the large quantities used to supply water to a region or for irrigation, stakeholders who want to speak the water world language, need to become comfortable with both. One-acre-foot is 325,851 gallons; an acre-inch is 27,154 gallons. Some agricultural water demand statistics are reported as acre-feet of water per acre of crop. 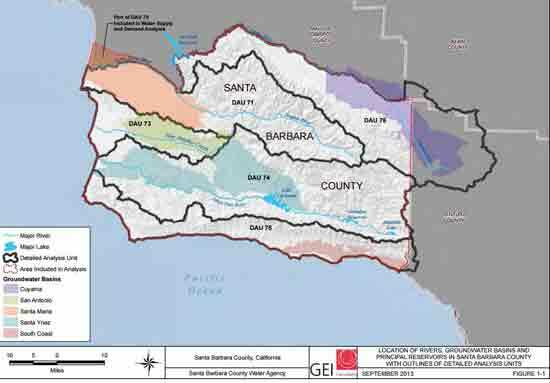 In 2013 gross water use for the city of Santa Barbara was reported as 15438 acre-feet. The DAU (Detailed Accounting Unit) is the geographical accounting unit for water in a specific area. This concept is useful largely for regulatory and insights, based on diverse studies, with diverse purposes. the stakeholder needs to attend to who reports what and why. 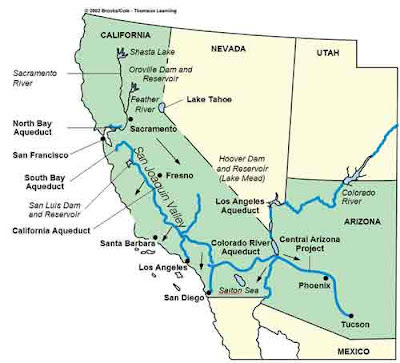 The United States is divided and sub-divided into successively smaller hydrologic units which are classified into four levels: regions, sub-regions, accounting units, and cataloging units. The hydrologic units are arranged or nested within each other, from the largest geographic area (regions) to the smallest geographic area (cataloging units). Each hydrologic unit is identified by a unique hydrologic unit code (HUC) consisting of two to eight digits based on the four levels of classification in the hydrologic unit system.Each DAU is watershed based, encompassing one or more rivers and their tributaries, and one or more groundwater basins. Within Santa Barbara County, there are five DAUs: the Santa Maria (DAU 71), the San Antonio (DAU 73), the Santa Ynez (DAU 74), the South Coast (DAU 75), and the Cuyama Valley (DAU 76). These last three posts provide an overview of what stakeholders need to understand in order to participate effectively in their water futures, which can be considered proxies for the good life.